Matt and I wanted to make the most out of our last day in Colorado. 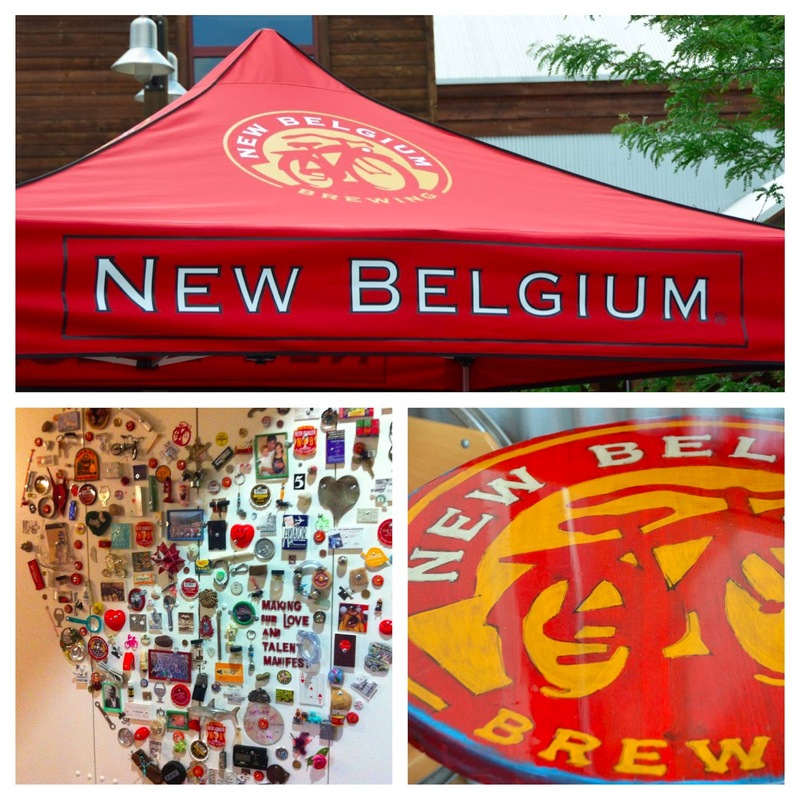 Before leaving Fort Collins, we stopped at the New Belgium Brewing Company. 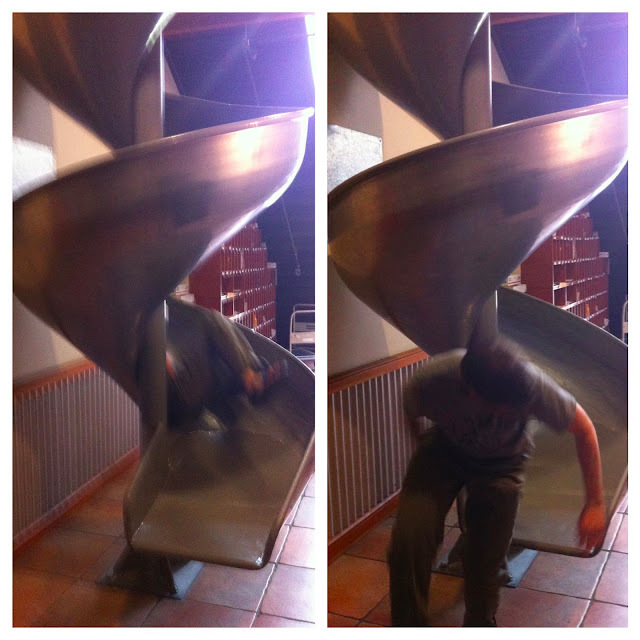 Although Matt lived near Fort Collins for two years, he had never been on an official tour of the brewery and so this activity was at the top of his to-do list. When we arrived at the Brewery, we had to put our names on a waiting list for the tour. The first tour ended up being full, but we were first on the list for the next tour, which was 30 minutes later. This gave us just the right amount of time to visit the brewery store and roam around the main building of the brewery. 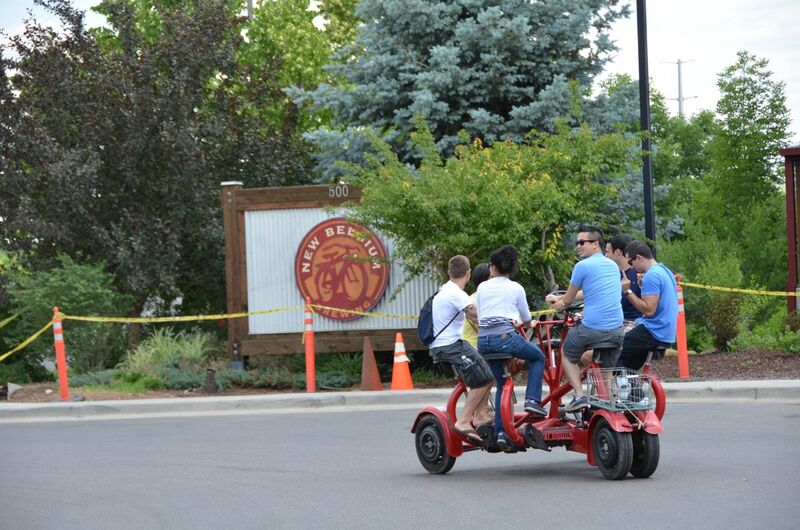 I think this would be an ideal way to do a "brew tour" in Fort Collins. Home to nine microbreweries and where more than 70% of Colorado's craft beer originates, Fort Collins was named the best place in the country to live by Money Magazine. 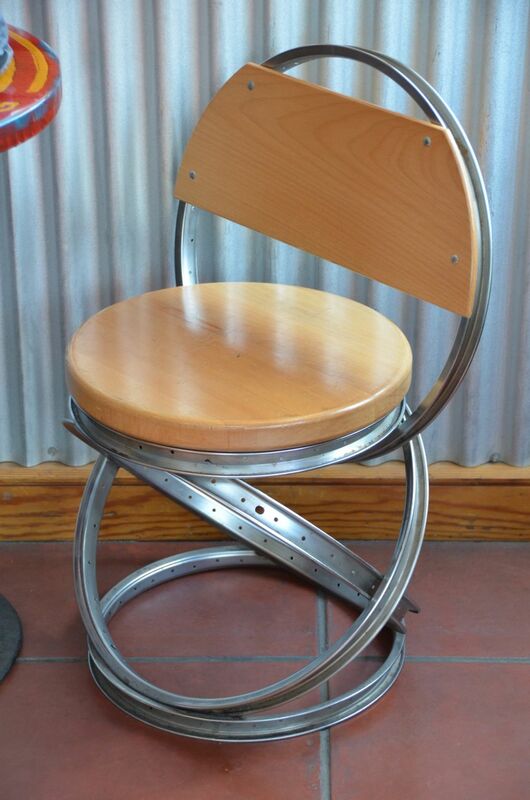 These are the chairs that were in the brewery lounge. 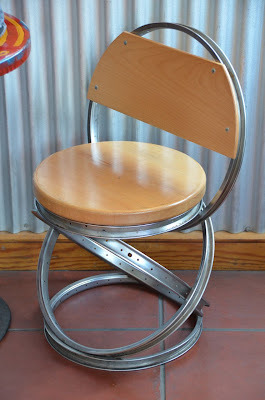 You'll notice the "legs" are made out of tire rims. Eventually the tour began...and boy was it a great tour. 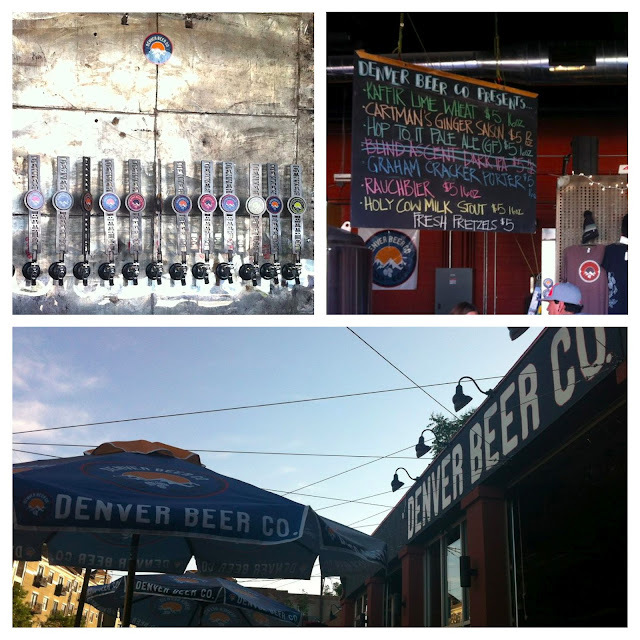 I've been on quite a few brew tours and I would definitely rank this tour in my top two. 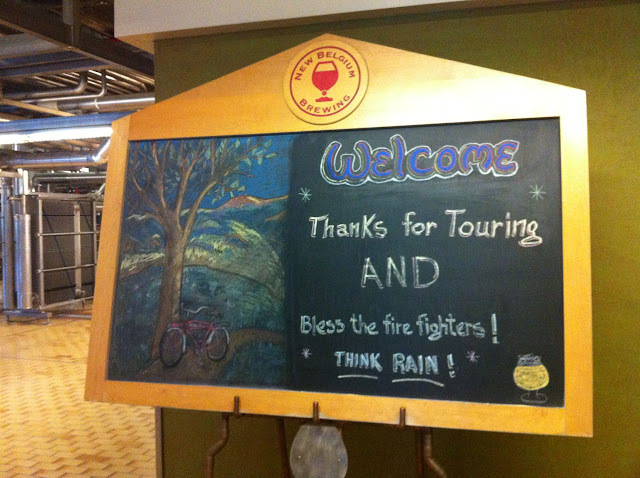 Our tour guide had worked at New Belgium for almost 20 years and obviously knew the ins and outs of the company. However, Matt and I both agreed that we wish he had talked more about the brewing process rather than the company itself. 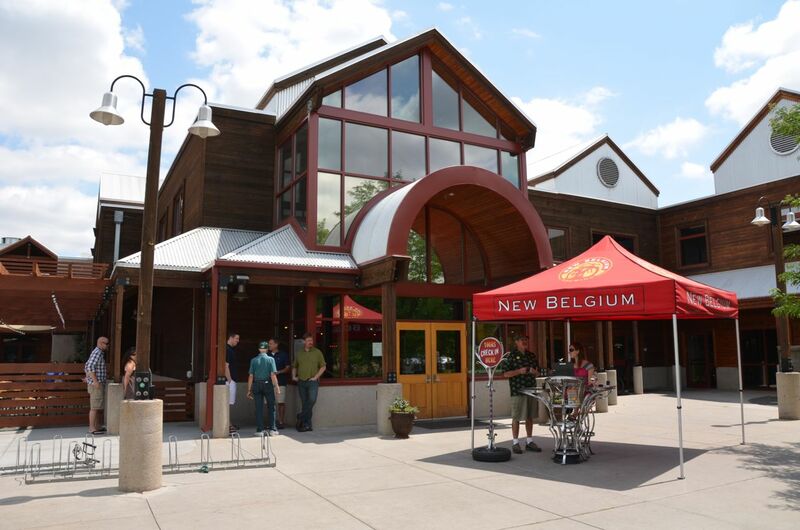 New Belgium Brewery has made it a goal to be entirely wind-powered. Rather than directly using wind-generated power, the brewery elects to pay an increased rate for their electrical energy, which is supplied by the City of Fort Collins Utilities to ensure it comes from the cleanest source possible. About 10% of the brewery's power comes from methane gas created as a byproduct of their on-site water treatment plant. 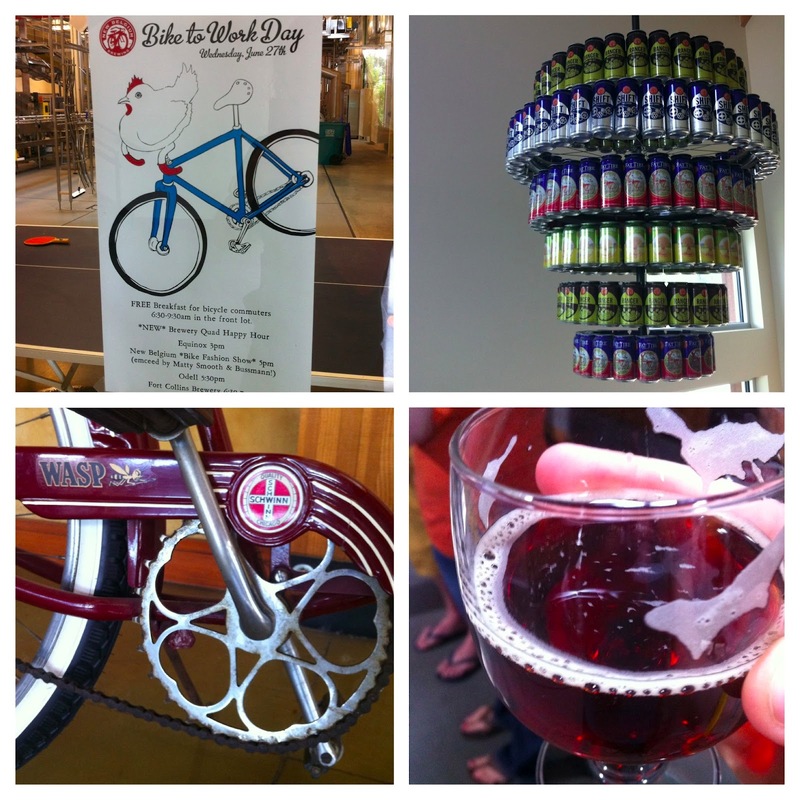 In addition, employees are given a limited edition "New Belgium fat tire" bicycle on their one year anniversary of working for the company and incentives are given to employees for riding their bike to work...and to employees who drive Eco-friendly vehicles (parking spots are labeled by gas mileage...the better the mileage, the better the parking spot). 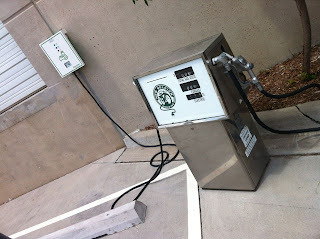 This "gas" pump is actually a charger for electric cars. We were given a number of tastings during the tour. 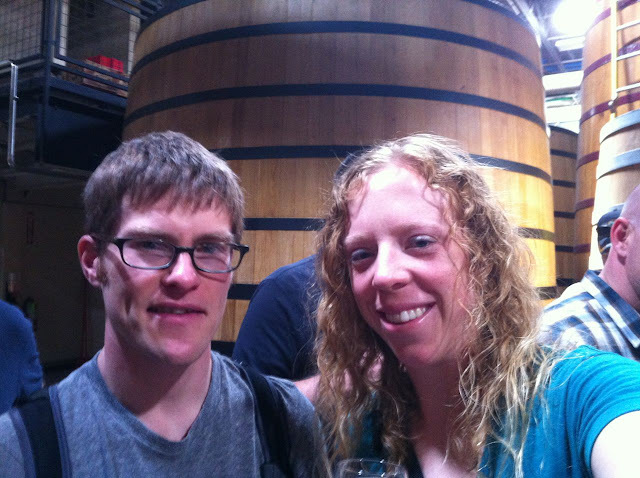 This is Matt and me in the barrel room, where wood conditioned beers rest one-three years before bottling. These oak barrels were gorgeous and actually purchased from an old winery. After finishing the tour, we headed for Denver to meet up with two of my friends from college. I was so excited to see Kelsey and Jason again. Kelsey was my RA my sophomore year, becoming a good friend at the same time. Kelsey and Jason dated throughout college, so I got to know Jason as well. 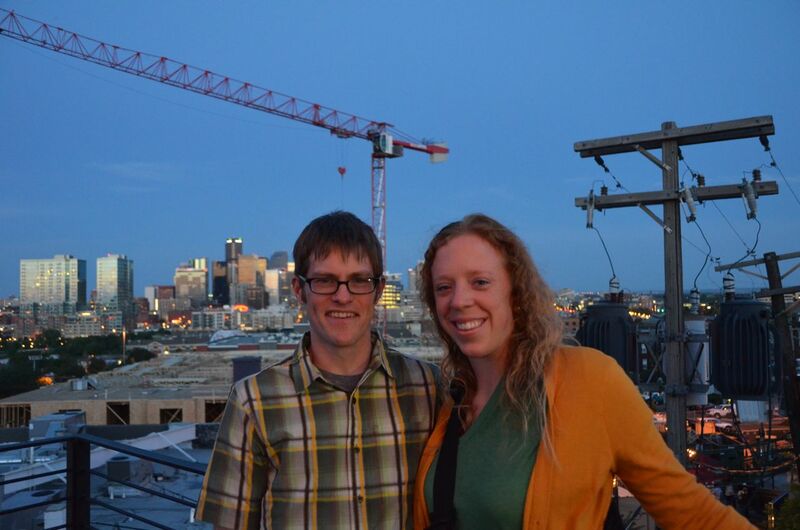 Kelsey has her own blog, Cornfields to Mountains, which summarizes Kelsey and Jason's adventures in Colorado since moving from Iowa in the summer of 2011. Upon arriving at Jason and Kelsey's house south of Denver, we quickly caught up and headed to Denver Beer Co, which was established in 2011. 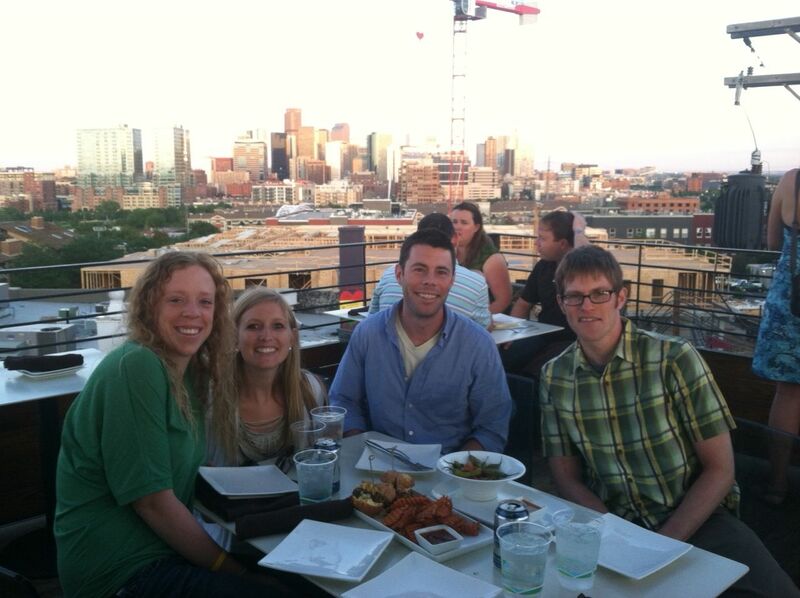 We all enjoyed a beer on the patio before heading to Linger for Happy Hour. 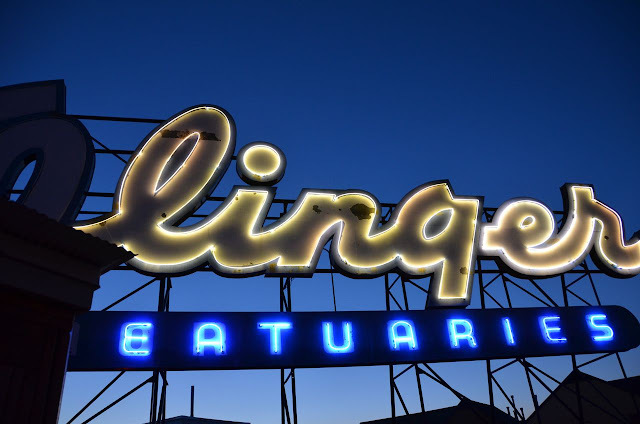 This place was great. 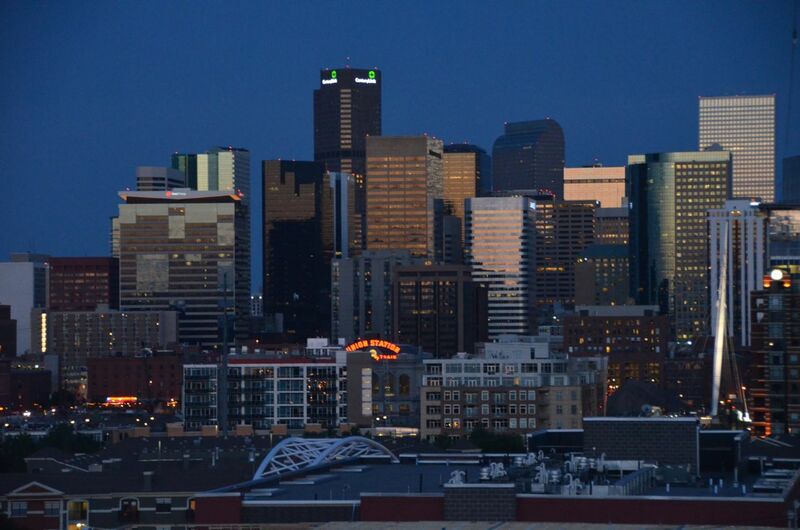 We truly took advantage of the great view of the city but the conversation we shared was even better. After Linger we grabbed some sushi at one of Kelsey and Jason's favorite restaurants and then headed back to their place for the night since Matt and I both had early fights in the morning. The hospitality Kelsey and Jason provided was so pleasant...it was a great way to end vacation. While I was headed back to Anchorage, Matt visited his parents in Nebraska for a few more days before returning home. A long week we both agreed that it was nice to get out of Anchorage but felt great to get back to town...especially to see Rio, who was being taken care of by Leah (thank you, Leah!!! ).